Woman724: Mother’s Day – My Special Amah. 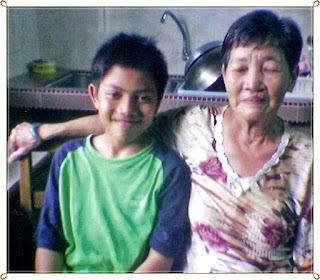 Mother’s Day – My Special Amah. This special lady is my house-help, my dear Amah who scolds and ticks me as though I am her”naughty little daughter”. We dearly love this lady, a mum to me and a grandmother to my kids; she is a 77years old Chinese lady! (Photo: my son and Ahso). Buy or spend anything excessive, she will yak yak nonstop to teach us to be thriftier. She will nag my kids for not keeping their rooms clean or if they don’t listen to me. I have advised her many times to please please retire but no, she insisted saying that she loves working and will die if she stops. Such a hardworking, dedicated, passionate and lovable lady she sings as she tends to her daily chores. 1998 Ahso introduced me to a young Chinese girl, Ayee who workd for 4years, left to follow hubby to Ireland (Chinese Restaurant there). When I asked Ahso to find me a replacement, she volunteered her services, since year 2002. Remember when I was single, I got a Chinese couple to help clean my apartment? Ever since, I always prefer our local Chinese helpers. My in-laws n neighbours find my preferance strange - My kids are thrilled always getting presents and Angpows for both Hari Raya and Chinese New Year from them.They become so part of our family. Ahso is very well respected around here for her 'age' and her 'work ethics' - cant afford to be lazy around her! See, she effortlessly climbs and sit at the top of ladders to scrub the ceiling fans and the windows! hi katrina, wow ! ! that is really fantastic..